The gym based rehabilitation involved one visit to the gym per week under supervision and one day per week unsupervised. This was carried out for the entire 12 month period until February 2016, without a break. In February 14, 2016 I left Australia for Big Sky in Montana to test the recovery of my knee and to begin skiing again. I had hoped, due to the skill of the surgeon and the expert help I received during rehabilitation, that I would make a painless and complete return to skiing. This did not turn out to be the case. I now understand that just wanting to return to skiing and working hard to do so with expert assistance does not guarantee anything. A 12 month program, in hindsight, is probably not enough. To ease back into skiing, possibly 2 to 3 years of rehabilitation with time on the mountain will be required. 2. Some pain is inevitable as is some loss of strength and performance. 6. Having some form of skiing plan which involves stretching, icing, anti-inflammatories and rest days is essential. This will be an ongoing feature of the sport for anyone who has suffered a tibial plateau fracture. 7. You will not be able to ski every day of a holiday no matter how fit you are. 8. 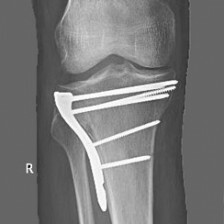 Rehabilitation from a tibial plateau fracture will extend into the second year if you want to keep skiing. 9. Clicking into the heel binding of your broken leg will cause intense pain. It does for my daughter Catherine and it does for me. You will have to learn to live with this peculiarity of your injury. 10. It is not the surgeon’s fault that you cannot resume skiing where you left off. Nor is it the fault of your personal trainer or physiotherapist. It’s just how it is. You have sustained a significant injury producing trauma in the knee joint. You now have to learn a programme for dealing with it if you want to keep skiing.